I’ve just received a link from Rosalyn Willson to an excellent infographic article titled “Gimme Shelter: Homeless in America. It focuses on the many faces and causes of homelessness in the United States. The article notes that there are approximately 62,000 or 13% of the homeless population that are veterans. In a 2011 HUD study it’s was learned that veterans are 50% more likely than other Americans to become homeless. While the article cites some pretty grim statistics, it also provides a small glimmer of hope. It lists some famous people who were once homeless and where they stayed. It’s quite surprising to learn of them. I hope all my readers will go to the following link and read the full article. It is very informative and should make those of us who have a home realize how very fortunate we are. Plus it may prompt us to see what we can do to become part of a solution to this crisis. It’s heartbreaking and shameful. As such a rich nation, mustn’t we do better? The only lasting solution to homelessness is permanent housing. Far too often, however, we attempt to treat the symptoms of homelessness instead of its root cause. While the intentions behind this approach were good, the unfortunate result was that very few people ever escaped the streets. 100,000 Homes communities believe this traditional approach is backwards, and the data agrees with them. Countless studies have now shown that we must offer housing first, not last, if we want to help people out of homelessness. 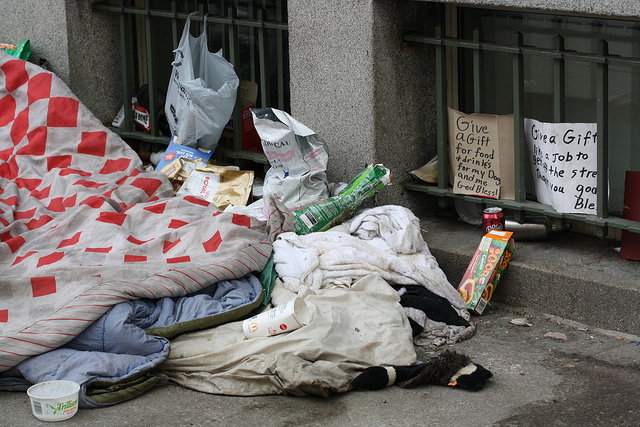 An immediate connection to permanent supportive housing can ensure that over 80% of homeless individuals remain housed, even among clients with severe substance abuse and mental health conditions. The bottom line is that it is just too difficult to battle addiction, take care of serious physical and mental health conditions or find steady employment while simultaneously battling homelessness. Contrary to popular opinion, these things are not precursors to housing. Instead, they stem from the safety and stability that comes from having a permanent home in the first place. That’s why all 100,000 Homes communities adopt a “Housing First” approach. Housing First is a simple philosophy that dictates that the most vulnerable and chronic people experiencing homelessness be offered the choice to move into permanent housing combined with available supportive services (“permanent supportive housing”) right away. It discourages imposing conditions on permanent housing, whether related to health, employment or sobriety. This approach has a documented track record of ending people’s homelessness while often encouraging them to make their own choices to get healthy, quit drugs and alcohol, and find employment when possible. Studies also show that Housing First approaches involving permanent supportive housing tend to be much cheaper for taxpayers than allowing people to remain homeless. As homeless individuals with the highest health and service needs benefit from the stability of housing, they are better able to tend to their needs in productive, self-driven and long-term ways. As a result, they make less frequent use of expensive, publicly funded services like emergency rooms, shelters and jails.